Leonie has been passionate about art, crafts and creativity since she was a young child. She studied fashion and design at the University of Central England and then went on to build successful leather accessories brand. In recent years she felt she had missed the hands on creative side of what she does and wanted to experience the craft side of design and hand making accessories once again. Getting back to the fun and mindful process of hand making something from scratch was the driving force to set up her workshops. The process of teaching others how to hand make items they would normally buy in a shop or online is a rewarding feeling. The end result that Leonie would hope to achieve is for you to go away having had a fun learning experience and feeling proud that you have handmade something that is unique with your own hands. Leonie looks forward to welcoming you to her workshops. If you have any questions, please contact Leonie using the ‘contact host’ button on the website page. Really interesting, fun and easy. 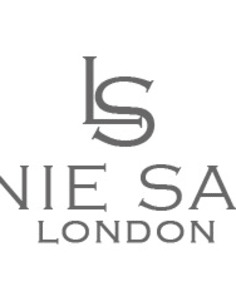 A good range of leathers and Leonie was very personable. Did the class with my partner and we made them for one another - so great to do a different type of date! Super friendly and informative. Leo was extremely helpful and demonstrated excellent knowledge. Venue was lovely too ! Leo Leo was a fantastic and friendly host. Very patient with a total novice and was very happy to answer any questions. A thoroughly enjoyable workshop! I enjoyed the workshop very much.. 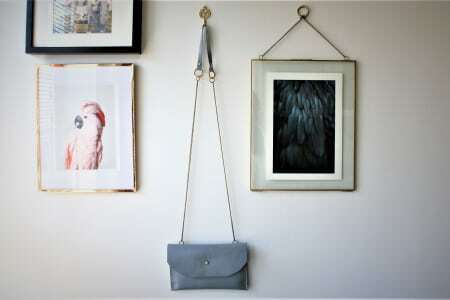 Working with leather and some tools I was able to create something fuels beautiful. Although I had never worked with leather, it was not too difficult. Really recommend the workshop! What a great experience! I got to learn a new skill with a wonderful instructor. I would recommend this session to everyone who wants to try something new and creative. Leonie was informative, clear, passionate and is obviously an absolte professional. Would really like to do another of her courses. Thanks for making a rainy afternoon in the park fun!! Leonie's class was brilliant, she was really patient and great at encouraging our own creativity. The materials she used were great quality and she made sure we all had fun whilst making our charm. 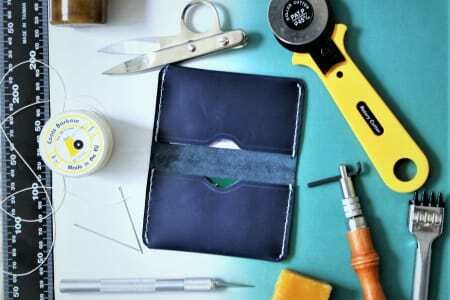 The workshop was enjoyable and definitely made me want to work with leather in the future. I was able to use some tools I had not used before. Leonie made sure to go at a pace that suited everyone and had a wealth of knowledge. Would definitely recommend the workshop! The class was delightful. I enjoyed learning to work with leather and Leonie was the perfect host that I am looking to book another of her classes. Leonie was very attentative and encouraging. 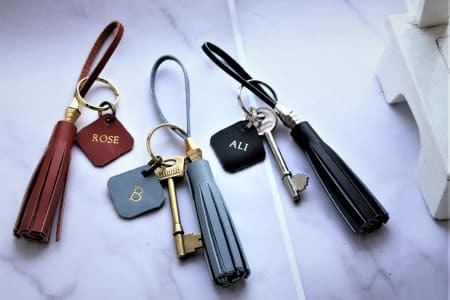 The information she provided us with was fantastic and more than enough to encourage me to persue leather charm making as a hobby to gift to friends and family. The quality of the item we created was so high! Thank you! This was a lovely little workshop which gave me a feel for working with leather. I was surprised how beautifully the tassel turned out and will definitely be showing it off! A fantastic teacher and great product. Thoroughly enjoyable despite the weather! Thank you! Leonie had so much passion and enthusiasm. She took us through each stage of making the key rings with patience and also made it really fun. It was great to have something like this at the festival to get us learning and it was nice to have something to take away. It’s clear she knows what she’s doing as had really beautiful products. The venue was nice for the amount of people. Leonie taught how to make a tassel key ring using beautiful leathers. She was very knowledgeable about different types of leather and the making process. Leonie is impossibly glamourous yet down to earth and made everyone feel welcome. Seeing some of her designs, I may have to book myself onto one of her other workshops! Leonie was great - the perfect mixture of informative and relaxed. We made really professional looking key rings. A great class! A really good class - nice to be able to just drop by and do something a bit different. Leonie was really friendly! 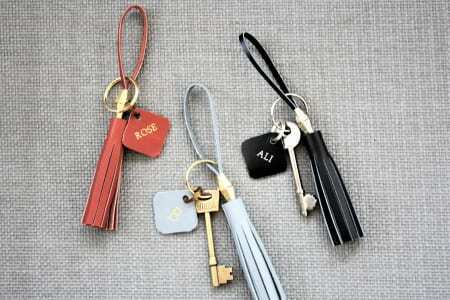 Make a Luxury Leather Key Ring and Personalise it.